How many times have you chased your kitty away from your curtains, carpet or couch? No matter how many times you try to stop unwanted scratching, sometimes that message doesn’t stick! So why do cats love to scratch so much? And if they’re scratching somewhere they shouldn’t, how can you help them find a better place to put their paws? Scratching is a normal, healthy behaviour and instinct for cats, used for exercise and marking territory. If your cat is seeking out a perfect scratching spot - great - that’s a healthy habit! First of all, scratching is great exercise! Do you like to stretch when you wake up in the morning? Your cat certainly does! When cats scratch, they stretch out their back, legs and paws, and do a little pampering - scratching to file, sharpen and clean their claws. Cats like to feel relaxed in their own space, and use a number of methods to communicate their territory to other cats. 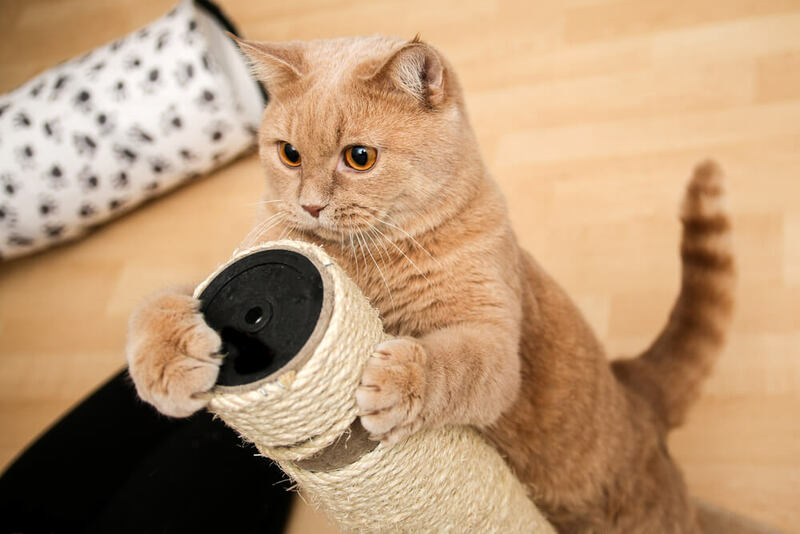 Scratching is one way for your cat to make their mark on their home, signal their presence to other animals, and feel happy knowing that their territory is safe. The natural urge to scratch is strong for cats; if a surface looks and feels good, they may find it hard to stay away! Because of this, it’s important to respect your cat’s instincts. Ensure their needs are met by providing alternative scratching options! Your cat will naturally seek out a range of places to scratch - so you should never try to stop them scratching completely. But what can you do if their favourite spot is somewhere unsuitable, such as your sofa or curtains? 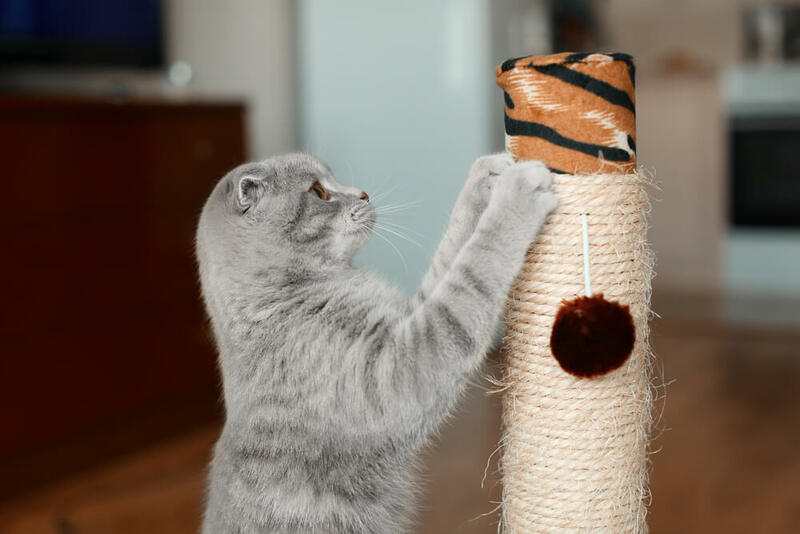 Choose a scratching post that fits your cat. Cats often like to stretch their whole bodies when they scratch! After all, everyone likes a morning stretch! Think about how your cat scratches. Some kitties prefer to scratch on a horizontal surface like a mat or carpet rather than use a post. Finding your cat the puuurrfect scratching option will tempt them to use it more! Consider natural textures. In nature, your cat would choose a sturdy, tall surface like a tree trunk to scratch on. So, choose a stable post wrapped with a coarse substance, like sisal fibre rope, as this is a similar rough texture. Experienced kitties know that location is everything! Cats often like to scratch after waking up; so it’s a good idea to put a scratching post by your cat's bed. It’s the cat equivalent of a cup of morning coffee! If your cat has already shown an interest in certain areas such as the sofa, strategically positioning a post nearby can help to redirect their claws. If you have multiple cats, make sure they have at least one scratching post each. There are many scratching options to try, and it’s better to have too many posts than not enough! Cute as your furry bundle of joy may be, cats prefer not to share their scratching space so make sure there are enough spots to go around! Keep in mind that all cats are different, and it may take time to redirect their nail sharpening. Never punish your cat for scratching in the wrong place - instead, work with them to discourage unwanted scratching. With support, praise, encouragement, patience and love, they’ll soon learn that the scratching post is the best option! Of course, even the most purrfect kitty may struggle to change their habits. Here, it can help to use a solution like FELISCRATCH by FELIWAY, applied to the post to send ‘territory’ messages, and encourage your cat to scratch there. Combined with FELIWAY CLASSIC Spray (on other surfaces, not the post), you can create a reassuring place for your cat to scratch, and prevent them from choosing other, inappropriate areas. Are you already a cat scratch expert? See how much you already know about your cat’s scratching needs with our ‘Scratching is a must!’ quiz!